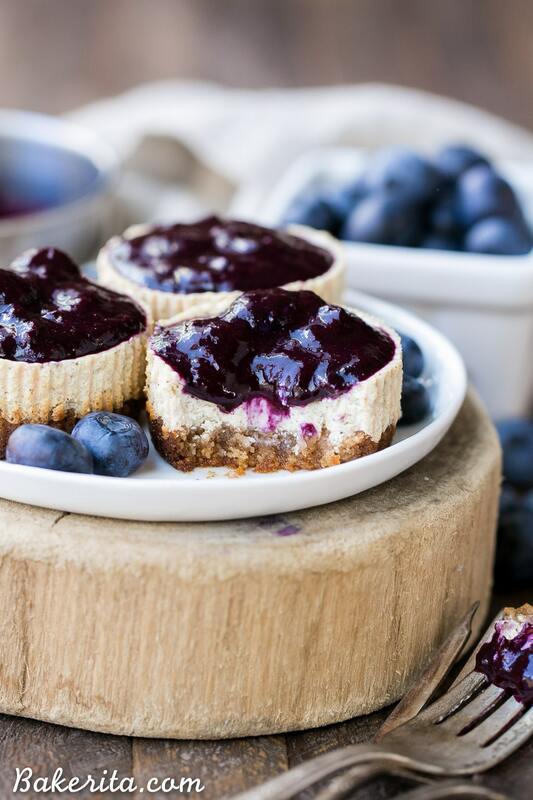 These Vanilla Bean Greek Yogurt Cheesecakes with Blueberry Compote are lightened up, but they’re just as creamy and flavorful as traditional full-fat cheesecake. 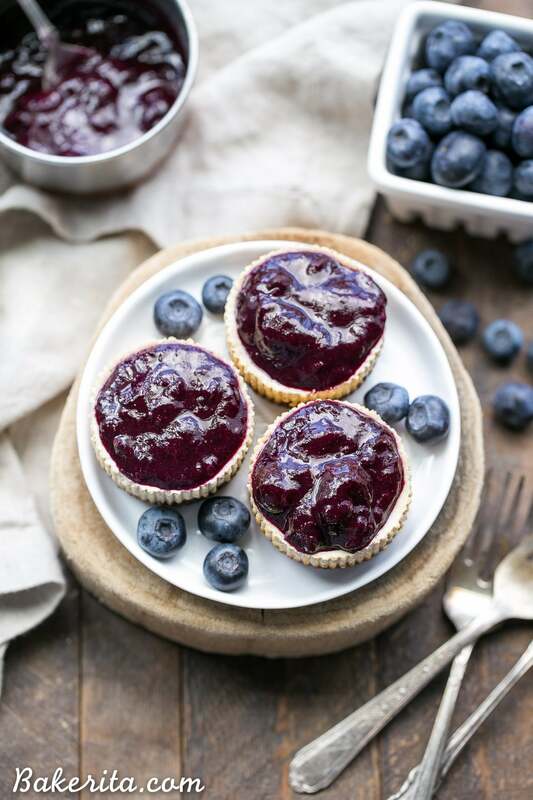 The easy blueberry compote takes this gluten free and refined sugar-free dessert over the top! I could do happy dances in the sunshine about how excited I am for Spring, and soon enough, summer! Not that we’ve had much of a brutal winter here in San Diego, but it has been abnormally rainy. I’m definitely ready for the sunshine to come back…that’s one of the reasons I moved back to California, after all. We had some nice 78°F weather the other day, so I think it’s fair to say that the sunshine is returning. With the sun comes the return of some of my favorite produce – summer squash, rhubarb, and berries galore. I can find fresh berries at the farmers market year round (#blessed), but during the sunny months, they become way more delicious and way more affordable. When that happens, I stock up and just about everything in my kitchen becomes berry-topped. It’s hard to resist a treat topped with beautiful, juicy berries – don’t you think? 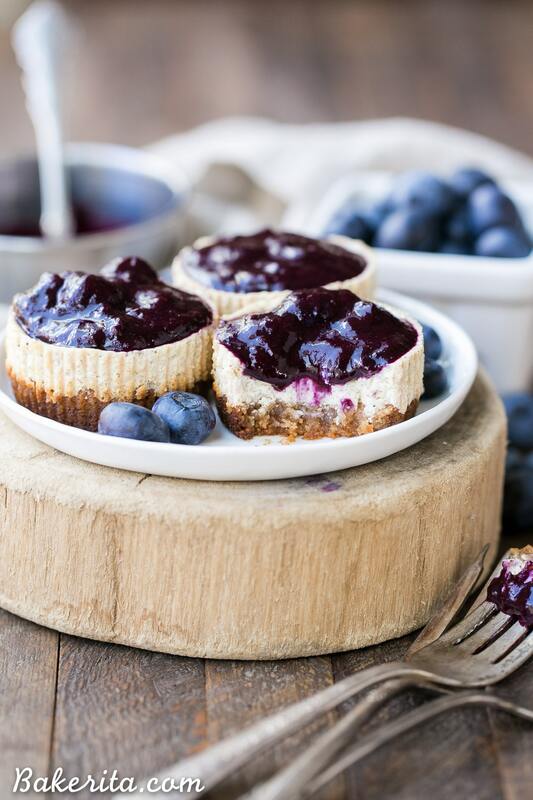 These Vanilla Bean Greek Yogurt Cheesecakes with Blueberry Compote were made with some of the first blueberries of the year, but because the compote is cooked down, fresh isn’t necessary. Until blueberry season is in full swing, frozen is just fine to use. 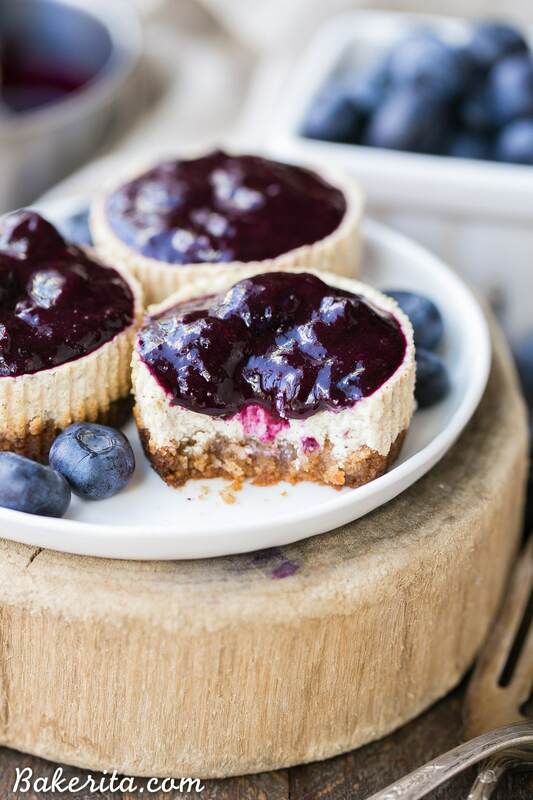 These little cheesecakes are definitely the perfect vessel to highlight the blueberry compote, but they’re also delicious enough to stand on their own. These vanilla bean cheesecakes are a lightened up version of regular cheesecake, with light cream cheese and Greek yogurt replacing the regular full fat cream cheese. Despite the lower fat content, these mini cheesecakes are still incredibly creamy and smooth. They’re just barely sweetened with honey, and flavored with vanilla – I adore the little vanilla bean specks, and the warm vanilla flavor is perfect against the tanginess. The crust, made with almond flour, honey, butter, and cinnamon, tastes eerily similar to graham cracker crust. It works perfectly with the smooth cheesecake and the blueberry compote. 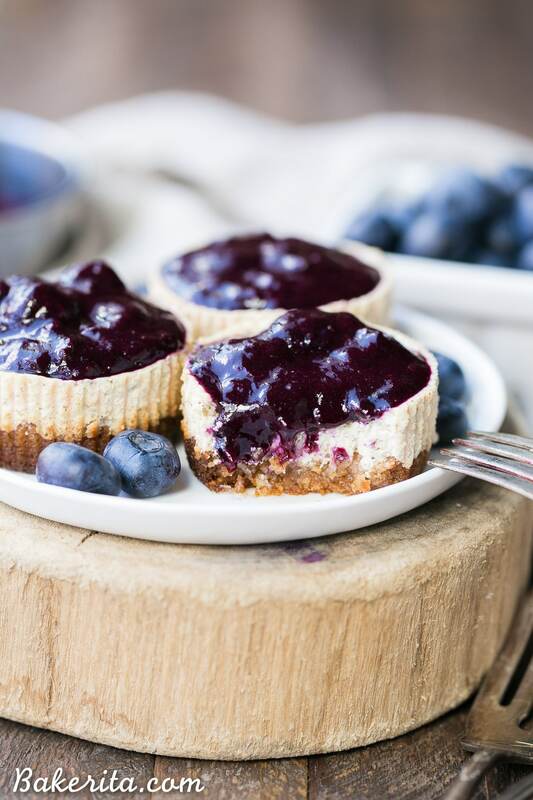 Sooo, as soon as you can get some delicious blueberries in your hands, I recommend a batch of these Vanilla Bean Greek Yogurt Cheesecakes with Blueberry Compote makes its way into your kitchen. They’re incredibly smooth, creamy, tangy, fruity, and delicious. And isn’t everything better when it’s mini? :) Enjoy! Preheat your oven to 350°F. Line a standard-sized muffin pan with 12 muffin liners. In a bowl, combine the meted butter, honey, almond flour, sea salt, and cinnamon. Stir until completely combined. Spoon about a tablespoon of the crust into each of the 12 muffin papers, pressing into the bottoms using your fingers or a spoon. Bake for 10 minutes and let cool while preparing the filling. In a large bowl or stand mixer, beat the cream cheese until smooth. Add the Greek yogurt, honey, egg and vanilla extract. Beat for a few minutes until completely smooth. Divide the filling evenly between the muffin liners. Bake in the oven for 22-25 or so minutes, until centers are set (they may have a very slight jiggle still). Allow to cool completely and then place in the refrigerator to chill while preparing the compote. For the compote, heat 1 cup blueberries, lemon juice & zest, and water in a small saucepan. Bring to a simmer and cook for 10 minutes, until the berries have broken down. Add the remaining ½ cup of blueberries and simmer for another 3 minutes. Remove from heat and let cool slightly before topping each mini cheesecake with a spoonful of compote. I’m looking forward to spring, too, although it’s been pretty mild around here, so I can’t complain too much. Although we did get some snow last night :( But these mini cheesecakes are cheering me up. So pretty, Rachel! I love using greek yogurt in cheesecakes! And that blueberry compote looks perfect! Blueberries aren’t perfect right now, but I’m buying them up by the pint because I’ve missed them so much! Cooking them down is a great way to enjoy them to cover up how tart some of them are. :) These cheesecakes are just beautiful and I think these would make a great breakfast! Me too! Can’t wait for all the berries to be at their best again :) thanks Marcie! love the idea of using yogurt in cheesecakes!! i feel like greek yogurt keeps it super creamy, but lightens it up (cheesecake is delicious, but it feels *dense* after eating a slice). It definitely helps lighten it up, and I love the tanginess! Thanks so much Heather. I just had to comment and say that these are ABSOLUTELY STUNNING! And I love the blueberry vanilla combo…two of my fave flavors. It’s amazing having fresh berries year round – definitely something I missed when I was in Washington! Thanks so much, Traci. these are so pretty! definitely wouldn’t be able to resist these!! I’m the same way with berries once they are in season – I buy wayyy too many! These little cheesecakes sound delightful!! These cheesecakes look incredible! Love the blueberry compote! Hi Star, I just updated the recipe to include nutritional info. Is it possible to substitute almond flour for coconut flour? Thanks! I’m guessing you meant sub coconut flour for the almond flour, since there’s no coconut flour in this recipe. I wouldn’t recommend it because coconut flour is so uniquely absorbent, but if you must, only use 1/3 of the amount called for. Made these today and they were so delicious! Another amazing recipe!! So thrilled you’re loving them, Neta! Thanks for the love!